I've been experimenting with this new technique (new for me). I soak a 5 x 7 piece of watercolor paper overnight in either coffee or wine and then let it dry. I then ink in my drawing and color it with Prismacolor colored pencils....loving the results, fun, fun. Would you like some WINE with your ART??? This piece measures 5 x 7, I soaked the paper in wine overnight and let it dry. 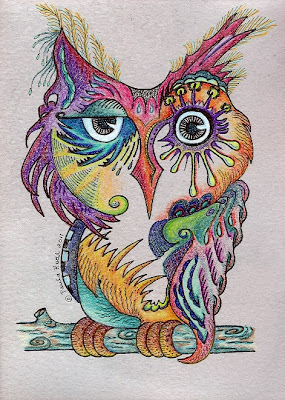 then I drew this little owl and colored it with colored pencils. 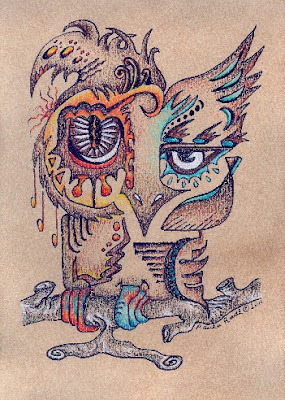 For this Owl drawing, the paper was soaked in coffee overnight and then left to dry. It measures 5 x 7 and I colored it with colored pencils, I call it..."Regular or Decaf".